Students from McAllen ISD’s Video Production course at the Student Television Network National Contest held March 27-31. KMAC won two first-place awards and one fourth-place prize. 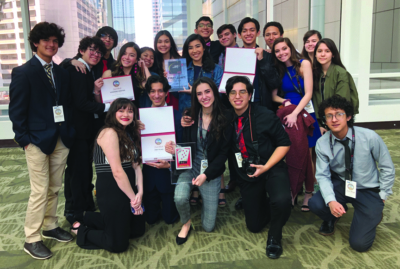 McAllen ISD’s KMAC, the video production students at McAllen ISD, recently returned from Seattle, Wash., with three awards from a national competition. Nineteen KMAC students were in competition with approximately 3,500 other students at the annual Student Television Network National Contest. Here, students from across the country competed in multiple film and journalism categories. Each category had 60 or more teams competing. Awards going to McAllen ISD students returning with awards are first place in Team Short Film, first place in Silent Film and fourth place in Promo Video. Winning projects include a short film about immigration, a short film about honesty and civic duty and a short promotional video about the convention, respectively. This is KMAC’s ninth year to earn first place in a category. It is just the second time KMAC has placed first in two categories. The Team Short Film category has been won by McAllen ISD for the third consecutive year.